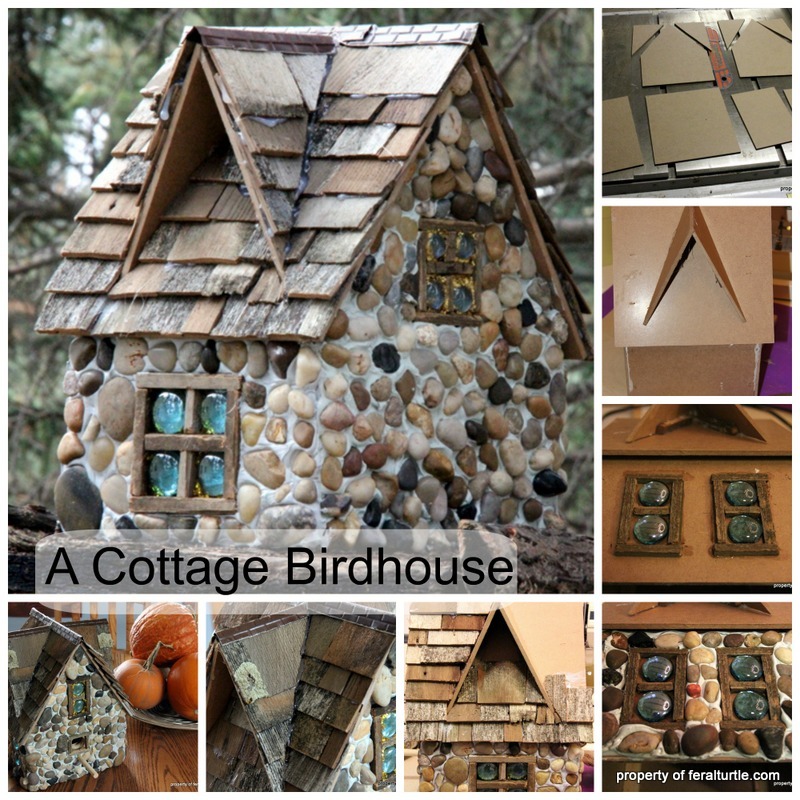 The Feral Turtle: A Stone Cottage Birdhouse With Dormers! I started this project last fall and finished it last fall. I blogged about it today! ???? ?No excuses, except for the spaceship and aliens, but that's another post, which also, will probably not be written. My sister was my inspiration for this birdhouse. Her birdhouse is amazing and huge, and when I saw it, I knew I had to build one. my birdhouse all day.... all those windows! My window frames were made from salvaged barn board. Grey exterior caulking was used as the adhesive and grout! This was used around the windows to make it look like the lights are on. I think my lights were off when I did this. I can't say this is my favorite part of the birdhouse. Now to add the perch and hole side. I beefed it up with some 3/4 inch plywood so that I had some meat to attach the perch to. Shingles were salvaged from an old shed here on the homestead. I think it took two shingles cut into smaller pieces to cover the roof. and a ridge cap was installed! MDF? In my woodworking days, my bucket list had "bird house" in it. I never did get to make one! I brought my circular saw, and hand saw with me when we moved, but we have no room to store material. Did you weigh it???? And I love the windows. That is one awesome bird house! Love the stonework and the roof -- you are just so "scrap-handy!" I can not even begin to tell you how cool this bird house is! We just finished putting up a fence and have a ton of scrap wood left over. My youngest has taken a shining with making things out of the wood scraps. I am pinning this so we can make a couple of these bird houses this summer. Awesome tutorial! This is absolutely DARLING! I don't care if it took you a zillion years! Holy cow Karen - this is spectacular - I just bought stones to do a fairy house like this - but there's no way it'll come out as gorgeous as this ! Amazing ! Makes me want to meet Rick Moranis so he can shrink me and I can move right in! Any bird would be happy to live here. So pretty! I like the golden windows, makes it look a little more fairy tale. That is the most amazing bird house that I have ever seen. Totally in love with it. Lucky birds!!! Absolutely adorable. I'm very jealous that birds have their dormer window, while I still don't. I can't wait to read that post about aliens and spaceships! Lucky birds! That's an amazing house! Love the dormers, roof, windows...C'mon sooo cute! Oh my goodness! So pretty!!! I love the roof! So realistic. I'm happy to know I'm not the only one 3 seasons behind. Love it! "The Feral Turtle" has been included in our Arlynda Lea's Sites to See #8. We hope this helps to call more attention to your efforts. Oh my gosh - so glad I stopped by! This is adorable. I would love to do this with my family girls. WOW! That is one impressive birdhouse. I made birdhouses, but nothing like this. What was the board you started with and what did you put the stones into. I like the windows and the gold to make the lights look like they were on. This is so, so, so cute! I saw it over at Suzan's this morning before I headed this way. You two...!! I love it! Coming over from Suzan's blog...wow, this is spectacular ! Love it-the windows and shingles are great! Your newest follower - would love you to visit me at The B Farm. You....are nothing short of amazing!! I love this!! !